Some places in the world are offering EVs for car sharing purposes. 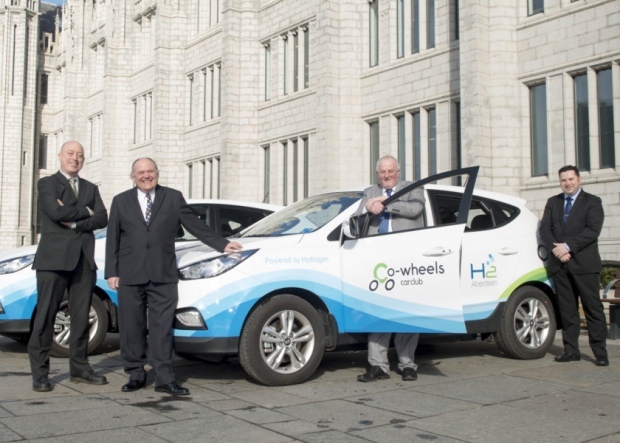 In Scotland, Aberdeen is the first to introduce H2 vehicles to the city’s car club. The city council and car club partner Co-wheels unveiled the two Hyundai ix35 FC SUVs that will be used for this service. The cars will be made available for public use on a pay-as-you-go basis later this year, following an initial testing period and a series of promotional events. Aberdeen City Council secured Transport Scotland funding to buy the Hyundais with a view not only to encouraging businesses and individuals to try out and buy hydrogen vehicles, but also as the next step in building a hydrogen infrastructure in the city and extending the use of hydrogen-fuelled transport in the North-east and Scotland as a whole. As a leading hydrogen city, Aberdeen has been selected too to host the only Scottish event, which will close Hydrogen Week on 18 March. The Aberdeen Hydrogen Showcase will demonstrate the link between renewable energy, hydrogen, and transport in an event which will bring local authorities and industry together to explore achievements made to date and future opportunities. The city’s fleet of hydrogen buses, cars and vans will form the centrepiece for the event.